Members were treated to a tour of the amazing Medieval barn and church at Winterbourne by a team of knowledgeable guides. Firstly, however, we headed off to look at the series of Medieval fishponds, which are part of a stimulating countryside walk in the area around Winterbourne. The ponds are known as ‘Monks Pool’, although there is unlikely to have been any connection with a monastic institution. Instead, they would have provided the owners of the Winterbourne Court with a ready supply of fish. 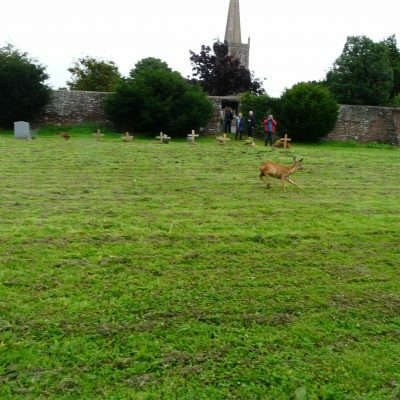 We returned to look at the fine Medieval church of St Michael, but not before disturbing a deer which had somehow got into the field by the churchyard. St Michael’s church dates from the 12th century, but is first mentioned in 1281. 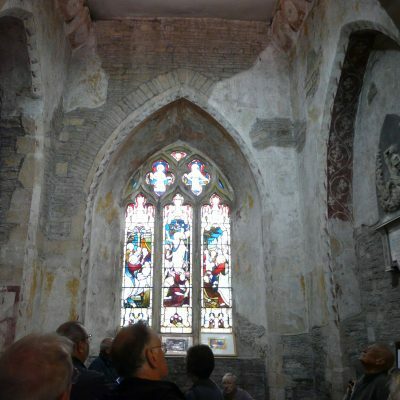 The chancel is certainly of the 12th century and is the oldest surviving part of the church. The tower was built in the early 14th century. The church has a fine series of wall paintings, commissioned by Sir Thomas de Bradeston who was lord of the manor of Winterbourne from 1328. 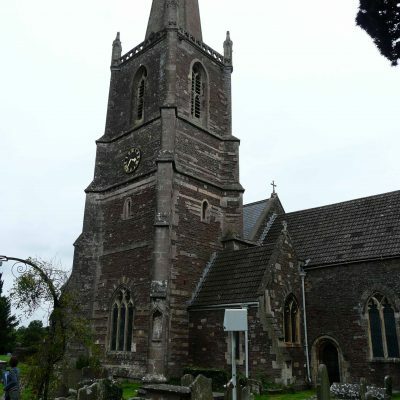 The church contains a number of fine stone effigies, one of Sir Thomas de Bradeston and one of his second wife Agnes. Our guide pointed out the fine workmanship of the effigies, including the undercutting of the legs – a difficult skill to master and indicating the expertise of the craftsman. There is also a fine brass plaque, probably of about 1370, and possibly representing Agnes de Bradeston. We then visited the wonderful Medieval barn, which was built around 1342, according to dendrochronological dates obtained from the roof timbers, and thus certainly built for Sir Thomas de Bradeston. 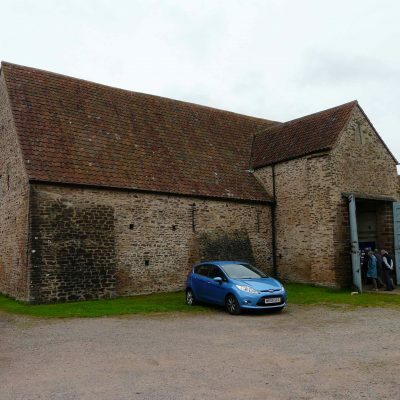 The barn would have been used for a variety of purposes, not merely for storage, probably being used also for weddings and other social occasions. 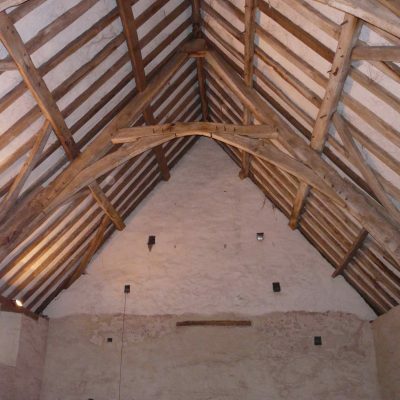 The magnificent roof is of the raised cruck type, with each principal rafter embedded in the wall on a short horizontal timber. It was originally of 11 bays but had been shortened to 7 bays. However, at the west end, where the barn has been truncated, there are mortices for braces that indicate the continuation of the roof. 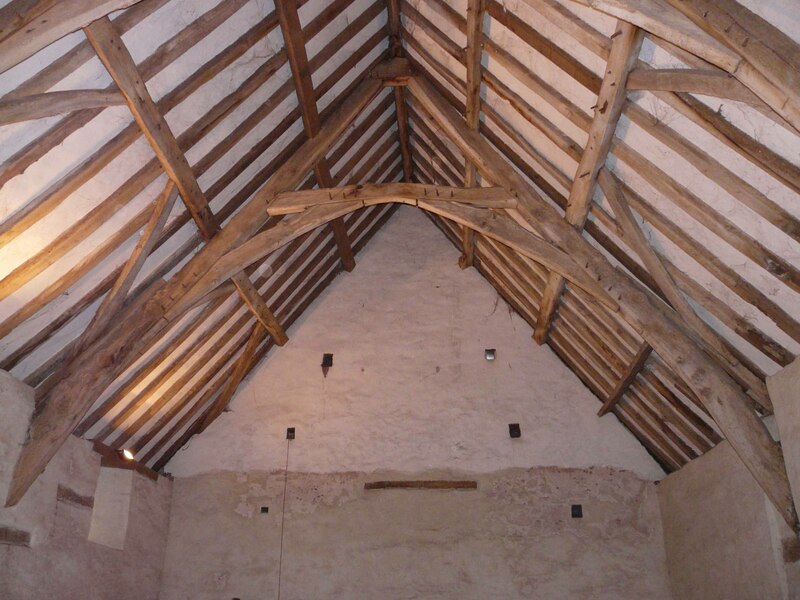 Each cruck represents half a tree divided lengthwise, but in no case were two crucks from the same tree. Therefore, the twelve surviving crucks were from twelve separate trees, representing a huge investment in timber. On a day when rain threatened, but did not materialise until we were sheltered in the barn, we were treated to a fascinating and well-informed tour of the church, the barn and the fishponds, which, with the late Medieval dovecote close by, forms an important group of monuments, centred upon the now lost Winterbourne Court. Many thanks are due to our guides for the day for sharing their knowledge of the buildings and for their generous hospitality.